Your sequence summary page shows the contacts currently enrolled in the sequence, along with additional enrollment information. 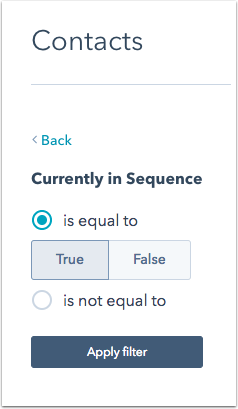 Click the name of your sequence. Here, you'll see an overview of your sequence's performance. Click the Enrollment date dropdown menu to view data from a specific time range. The name of the contact recipient. The company the contact is associated with. The user who enrolled the contact. The date the contact was enrolled in the sequence. The latest step the contact has received in the sequence. The date of the latest step. The status of the contact in the sequence. An Actions dropdown menu, where you can email, call, create a task for, edit, or unenroll the contact. Click the Status dropdown menu above the table to filter your enrollments by the contacts' status in the sequence. If you want to clone the sequence, delete the sequence, or move the sequence to a folder, click the More dropdown menu. If your sequence is not performing well and you want to make changes, click Edit. If you want to enroll more contacts in your sequence, click Enroll. Hover over a contact and click Edit to edit the sequence, or click Unenroll to unenroll the contact from the sequence. If you have a HubSpot Marketing Hub Basic or Professional subscription, use the Currently in Sequence contact property to create lists of contacts currently enrolled in a sequence.